It never ceases to amaze me how the Lord God works things out for our good and for his glory. Take for example this past weekend: several months ago a friend in Sicily contacted me and asked if I would be interested in leading a retreat for her women’s group. Are you kidding me? Sicily! Teaching the Word to women who love the Lord. I’m in! And then it dawned on me, this is a group affiliated with the military, and I know relatively nothing about the military. They also are Americans living in Italy and I have never lived in a foreign country with a different language and culture (I even had to research if Sicily was actually part of Italy – it is). I could only try to imagine what their lives are like. How could I relate? What could I possibly have to say that would encourage them? That’s when I started to pray. A lot. And that’s when God met me in my hour(s) of need. It’s wonderful how God steps in when we open the door to him. It doesn’t matter what our difficulty, our worry, our fear, or our struggle; when we invite God into our situation he always shows up in a big way. Of course he does, he’s a big God! That’s what he did for me as I prepared the study materials and the talks I was going to give to these beautiful ladies. God not only gave me ideas and Scripture to share with them, he also met me personally through the preparation. Who would have thought that in my striving to serve others, God would step deeper into my own life and heart and serve me. The theme of the retreat was “Refreshing Our Souls” and I discovered as I studied and prepared that it was my own soul that needed refreshment. As I opened my Bible and searched the scriptures for just the right passages, God poured his love into me. It was as refreshing as a bowl full of Haagen Das Butter Pecan on a hot August evening in Texas. Without God first refreshing me, the only thing I had to give to these thirsty women would have been the equivalent of warm, stale lemonade on a hot and humid day – ugh. But God saw to it that I had living water to revitalize their tired spirits and reinvigorate their love for him. It really doesn’t matter where we live, what our community is like, or whether the culture we are living in is a familiar one, we all have the same need for God. And whether we’ve known him most of our lives, or have only recently gotten to know him, we all need to continually refresh our perspective and our understanding of who he is. We need to hit the refresh button daily and load in new information by reading and studying his Word. We need to see God bigger today than we did yesterday. We need to understand his sovereignty over our circumstances more clearly. We need to grasp the depth of his love for us more intimately. We need to rediscover how amazing his grace truly is. We need to see the beauty of his justice and mercy. We need to be overwhelmed by him. Our faith in, our love for, and our hope in God grows as our knowledge of God increases. And when we uncover the truth that we cannot uncover all there is to know about God then we will yearn for eternity and the prospect of all that we will continue to learn. We also need to throw back the curtains that conceal the darkest corners of our own hearts and take an honest appraisal of who we are and who we are becoming now that we have been saved by grace. For while we are God’s masterpiece (Ephesians 2:10), he is not finished with us yet, there is still much he work that he is continuing to do (Philippians 1:6). 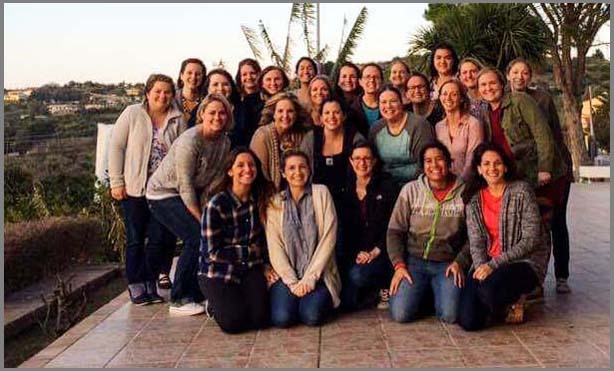 It was my privilege to serve as a source of refreshment for this group of women in Sicily. Perhaps one of the reasons why we, as Christians, are called to serve others is because when we are serving others many of our own needs are met. I have surely been refreshed! Do you need refreshment from God? Do you need a refreshed perspective of God? Will you challenge yourself to learn something new as you read your Bible this week? Will you look deeper than the surface, beyond what you already know? Will you look for God in your circumstances? Will you look for his grace.